This is what the NY Gallery put together about me...I am awed. "Contemporary Figurative piece by Toronto-based Polish artist Eva Lewarne. Mid-Century modern acrylic painting on canvas with surrealistic motif of raven symbolism. Eva Lewarne has been living in Canada for many years. She graduated from OCAD (Ontario College of Art) after doing a Psychology and English major at the University of Toronto. She has always painted. It is her first and last love. 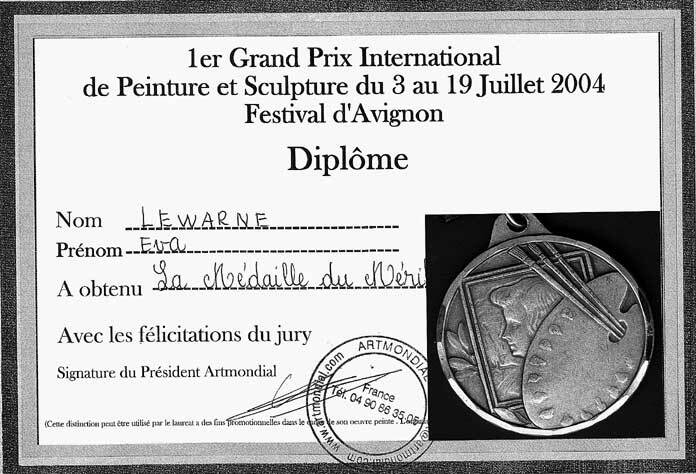 In the last few of years, she received a Medal from France in a Painting Festival in Avignon. She was also featured at the Grand Palais in Paris before that, where her work was stolen from an international exhibition called Figuration Critique. She supposes that the French felt an affinity with her theme and style. She showed again in Paris in November of 2015. Photography is her second passion. She is represented by Gallery Gevik in Toronto. Like Bob Dylan, Eva Lewarne likes to explore how one's mundane moment-to-moment life relates to the greater Life, of birth and death. "My love, she speaks like silence / Without ideals or violence -" writes Bob. "Love Minus Zero is what? - just love or Love. We have eyes to see and windows to look through, but can we really use them? Or, do we blindly stumble along , feeling lonely. Not-Two and Not-One. Then what? A mystery for you to decide." Eva was born in Poland but has lived half her life in Toronto. 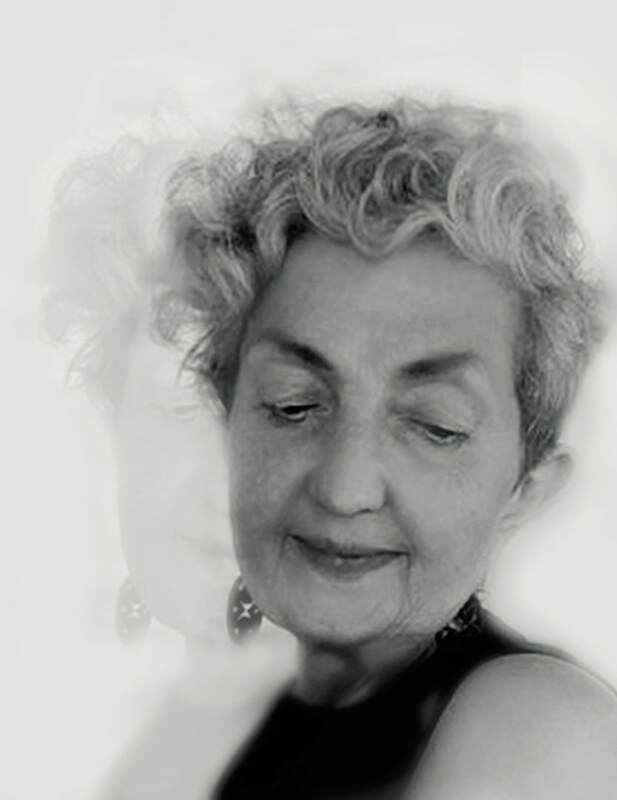 For better or for worse, she speculates, both countries have influenced and shaped her art. Mostly it has been introverted meditation and silence that gave birth to the images in her paintings, telling a story of her inner worlds. The un- compassionate politics and devastation in the world today has also captured Lewarne's attention. She thinks it is crucial that people recognize the difference between living beings and inanimate objects, such as live animals and nature or robotic technology. We have started to mistreat what is alive and worship the inanimate, creating life-like bots and treating them with reverence. For this reason, Lewarne often paints women with animals such as ravens or flies to show the human affinity that coexists with them. 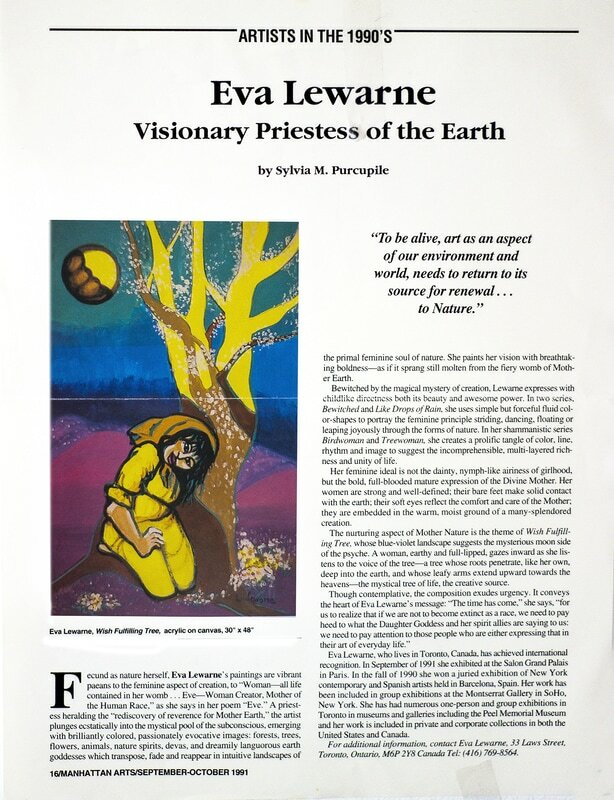 An artist’s role is one akin to a Shaman’s role: to try to heal our earth and ourselves." Even as a young child I was visual….and at 8 years of age, while everyone in the family was watching their new black and white TV, I was sitting on the floor with my sketch pad drawing their feet and hands. Mona Lisa hung above my bed and across from her a Modigliani. I wanted to paint like that. I was also moved by the works of Peter Bruegel and Bosch. They inspired my compassion for the suffering of people. Bruegel’s “Beggars” and “Cripples” had a huge impact on my view of what life must have been like for people in their times. I was more inspired by this work than by the portrait paintings of Aristocracy at the time. The paintings made me curious about my society and life around me and I would observe and search out the faces of people that were suffering around me, trying to guess the cause of their pain. And there always was suffering, and I thought about ways to capture it on canvas or paper. My paintings became motivated by trying to capture emotions, not only pain but also other more subtle emotions like awe and pensiveness…and the un-nameable and un-knowable ones, the mystery of life. Mona Lisa is to this day shrouded in mystery, no one has been able to guess her state of mind, her story and I think that is what I loved the most. I am a post-war child born right at the end of World war II in Poland. I have pictures of myself walking with my Grand-father among the ruins of the city. Going to school we took trips to Auschwitz, under the belief that if we see the millions of children’s shoes left behind, we will never make the same mistake in the future. I cried and had nightmares for years after, and yet when we look around now nothing has changed. Many Hitlers have been born and died and still exist. As a young adult I began to meditate as way to find inner peace among the suffering of people everywhere. I began to study Zen then Tibetan Buddhism with a Lama, it saved me from depression, and slowly over 20 years i began to realize that life is impermanent, dark and light, and rich in its design. My compassion grew without annihilating me in the process, as well as my appreciation for ordinary magic, in life. And I embraced the dictum by Dogen Zenji that “My life is one continuous mistake” and that is okay…” I decided working on myself, my mind was important for me. My art is often the result of this study. I live in a pretty prison, in our earthly existence, we take so seriously, so meaningfully, so righteously. But in reality this body, this life is but a prison confining us to merciless doing, suffering, rejoicing and meaningless acts of boredom, killings and daily survival acts in an attempt to prettify the whole thing, find so called happiness and consume as much as we can of everything before we find our end. To add to the intrigue we have sleep, perchance a dream, a mysterious encounter with our own shallow existence of our mind. Then we discover God, a benevolent, sometimes frightening father that dispenses favour on some and pain on others. Maybe a mother would be better? No difference really.It is time to face facts, this pretty veneer called life is easily ripped apart when the prison walls start to narrow and tear, when there is no escape in view, no vacation from the fire eating up every shred of your hopes and dreams, and you can no longer ignore that all is illusion and you have to make the leap into the unknowable void, emptiness and scary jaws of what hopefully is bliss. AN INTERVIEW ABOUT ART WITH ME AT SPECTATORIAL WORDPRESS FROM UNIVERSITY OF TORONTO WRITTEN BY MAGDALENA WOLAK. ​I was born in Poland but have been living now in Canada for many years. I graduated from OCAD after doing a Psychology and English major at the University of Toronto. But really, I have always painted. It was my first and last love. 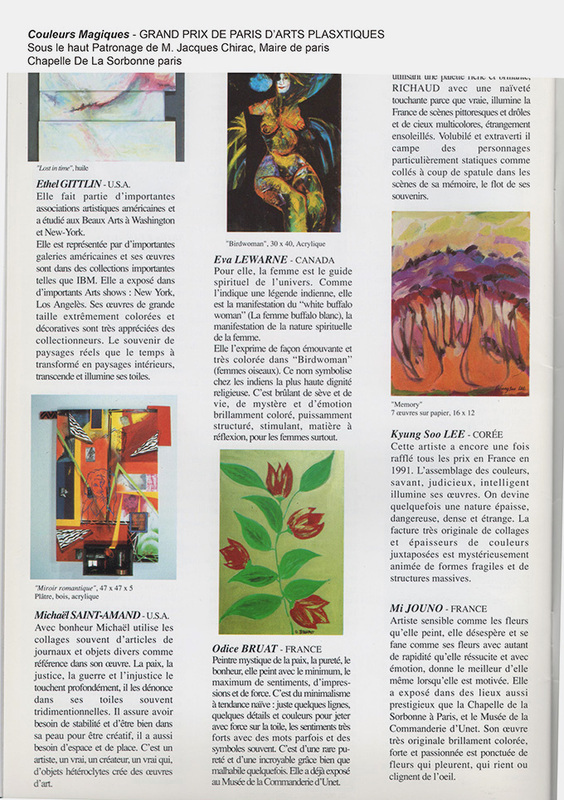 In the last few of years, I have received a Medal from France in a Painting Festival in Avignon. (Grand Prix). Not my first there. Also I have shown at the Grand Palais in Paris, before that, where all my work was stolen and the Paris police deemed it to be an honor as that is where Picasso was discovered. Photography is my second passion. ]When I graduated from OCAD (Ontario College of Art) my initial paintings were large surrealistic pieces like “Fool” which is on my image inventory. It depicts the life cycle of a woman; we are born, we grow up and then die, in between we drink coffee and shop, or so it seemed to me at the time. Also I had a number of what seemed like prophetic dreams back then, one of which was awakening to a city under water. I remember thinking in my dream that as long as I could still get a good cup of coffee, all would be well. From there I went on to paint “Birdwomen”. And quite honestly I don’t know where that theme came from as I had no knowledge of Aboriginal culture at the time and only discovered it much later on. However at the Met one day I fell onto a show of Birdwomen sculptures from Africa and Europe and realized that they even carved them in Poland during the earth religion era. I guess what I was trying to say was that we need to go back to seeing art as related to spirituality and life, not just an aesthetic idea. Now of course this is quite a common theme. This was almost 20 years ago. That series was popular in France, and I was offered a show at the Sorbonne in Paris and Bordeaux. A French writer said that his first novel was inspired by my paintings. I also have always loved to observe people in subways and trains and try to see underneath their personas. I did a number of portraits at the time trying to capture this. Then followed many paintings about Masks, the ones we hide behind and the ones that inspire us. I started to practice Zen Meditation for many years after and that spurred a series called “Silence”. Also at the same time I began to be interested in abstract art and tried to harmonize the real with the minimal. I had a solo show with this series in New York, Jadite Gallery. Now for quite awhile I have returned to simplified figures, people I meet in my art community, Queen West, young and old “Hip” people, the ones who move into an area because the artists are there, the ones who proudly walk their dogs who take on their owner’s expression. (“Man walking dog” and “Man With Dog”) “Peace” and “Ole for Aging” indicate my mood about aging. ​As long as I can be involved in art-making I am a happy camper no matter how the clock ticks on.